Nice lemony, mineral palate, tangy rather than tart. Super clean and refreshing, with a hint of pear and/or golden delicious apple. Very long, pleasant finish: these flavors want to sit in my mouth for a while, and I’m loving it. When the wine warmed up to a true cellar temperature, the minerality on the nose was enhanced: it smelled a lot like water evaporating from wet, hot stones. Like when you pour water on the stones in a dry sauna? That smell. The mineral on the palate got a little overwhelming as the wine hit room temp. I’d drink this wine on the cold side, because it tastes and smells yummy that way. People like to pair minerally wines with shellfish, especially oysters and mussels, as well as stronger fish like mackerel, swordfish, and trout. I always have a hell of a time smelling pear on a wine, so I get all twittery over wines that I smell strong pear scents in. This is not, strictly speaking, the best example of the vinification of the Albarino grape, but I really enjoyed the wine and it will be great with food. I am seeing this wine everywhere all of a sudden, and I think it’s because it’s one of the few reasonably-priced wines out of the Rias Baixas (REE-ahs BUY-shas) region of Spain. Of course, it could also be that they’re distributed in the US by E & J Gallo, which ways of making you buy their wine… Martin Codax (warning: their website is very Flash-y, and aurally enhanced) is a wine cooperative, which means that the grapes are grown by members of the co-op, and then made into wine at a common winery and bottled as one. Kind of like a negociant, but with the growers and the winemakers belonging to the same club. The Martin Codax cooperative farms about 530 acres of vineyards in the region. Rias Baixas is one of the few (the only?) 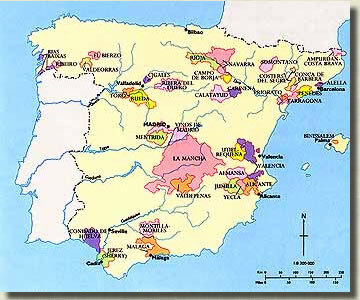 region in Spain that is best-known for its white wines, rather than its reds. It’s located just north of Portugal, and these people are all about the Albarino grape, though they do grow a some other white varietals, like Torrontes and Treixadura. They even grow a few red grapes, but if you’re talking Rias Baixas, you’re mostly talking about Albarino. Now, you can also find our v. interesting Albarino grape in the Vinho Verde region of Portugal, where they call it Alvarinho. Specs is selling a super-cheap (like $5) bottle of Vinho Verde that I can’t wait to try. Will probably take it to Blues on the Green this week, as it is lovely picnic wine. I know, after that long enthusiastic post about bag-in-box, I should hardly be toting glass into Zilker Park, but I want Vinho Verde so quit looking at me like that. 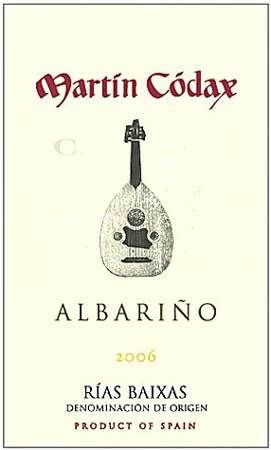 Your typical Albarino will usually have an herbal, grassy character to it, and present aromas of peach and pineapple. It is common to find good acidity and minerality. You want to drink it within a year or two of its vinification — this one doesn’t age so well, more’s the pity. I’m sure those wacky winemakers will find some way to fix that, eventually. According to this exhaustive article on Albarino at the SF Chronicle by Tim Teichgraeber, which also incidentally lists lots of neato wines to try, the US is now the largest importer of wines from the Rias Baixas. Try one today! I’m not a Gallo bargain, but let me know if you’d like to try my 2005 Albarino from Lodi. Reputable bloggers like yourself are pre-qualified to receive samples!